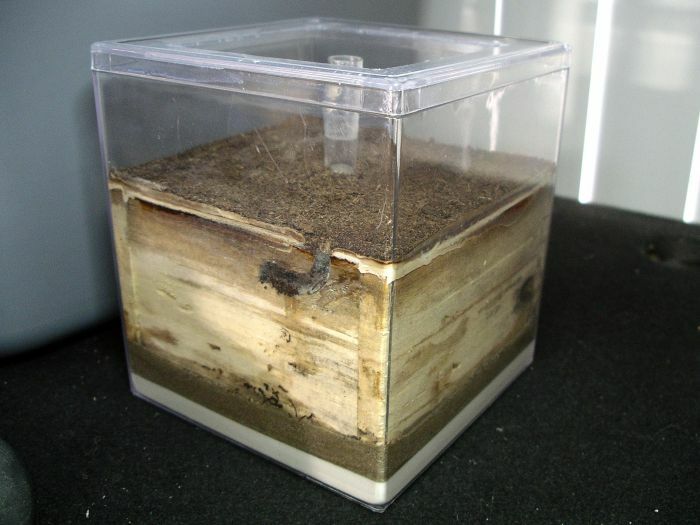 I have been planning to make some very big and very nice looking ant farm-style formicariums for a long time now. Before I spend a lot of time designing these, I first need to find the best way to make something similar to the classic "ant farm" that will not only be safe from collapse, but also leave he glass as clean as possible. I'm going to make a few smaller formicariums in an attempt to test out different methods, and also house some ants with them in the mean time. First I'm just going to try using plain old mud that will be allowed to harden between the panes. 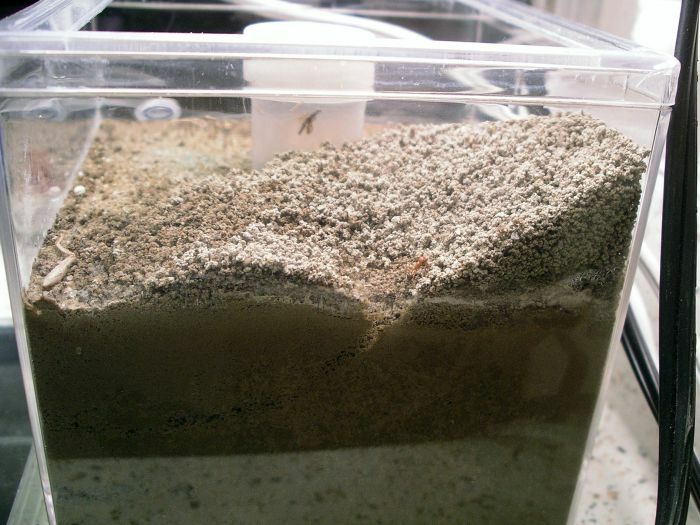 I used two clear plastic boxes--one inside the other to create a sort-of 360 degree ant farm, with a hydration tank in the middle. Plug hole (for the silicone plugs I cast): 21/64"
The tank has holes in the very bottom all covered with Hydrostone on both sides. 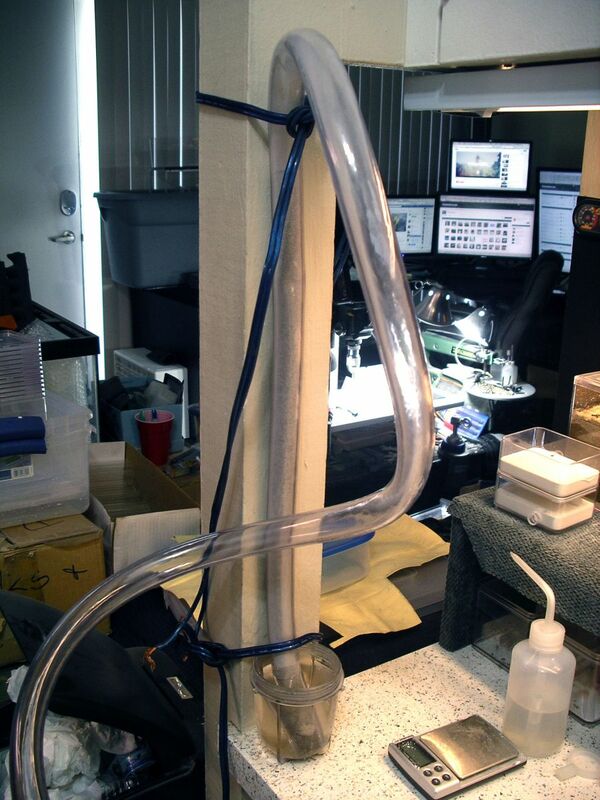 This should allow the water to soak through from the tank, on up the substate around it. 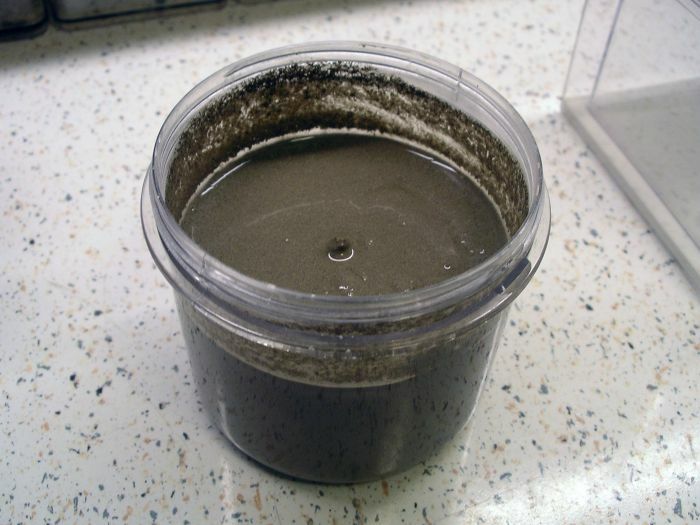 I mixed up a batch of 50 percent sand and 50 percent clay dirt, added water and poured it between the panes. I completely covered the inner container, and left a cylinder sticking out the top to add water. I dried it with a fan for a while, and once it was hard enough, I hooked it up to the broken old jar I've been keeping a colony of Pogonomyrmex californicus in. The colony immediately started digging like crazy and moved in just two days later. As you can see, this is very sturdy, but horrible for visibility. I hope you can find a good solution so i can steal it. Couldn't you make it thinner where the inner box meat the outer box? also some LEDs might help if you hook them up on the inside and turn them on when you want to see them. The gap between both containers is only about 3/8 of an inch. That's pretty thin already. Made some small ones today for my Dolopomyrmex pilatus queens. These should make nice little founding nests. Are you going to keep all of them in these setups? Nice! I like natural nests. Very nice looking formicariums. All of your work always comes out so clean and even looking. 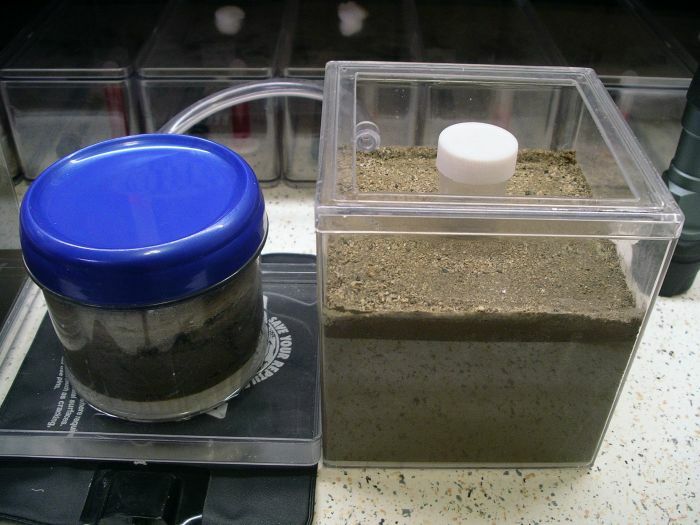 Have you experimented with substrate at all? You might be able to get a cleaner look into the nests if you use a coarser sand mixed with a very small amount of peat or potting soil. No. Only four right now. Thanks. "clean and even looking" is exactly what I want. I'm not quite sure what you mean by cleaner in regards to the substrate. 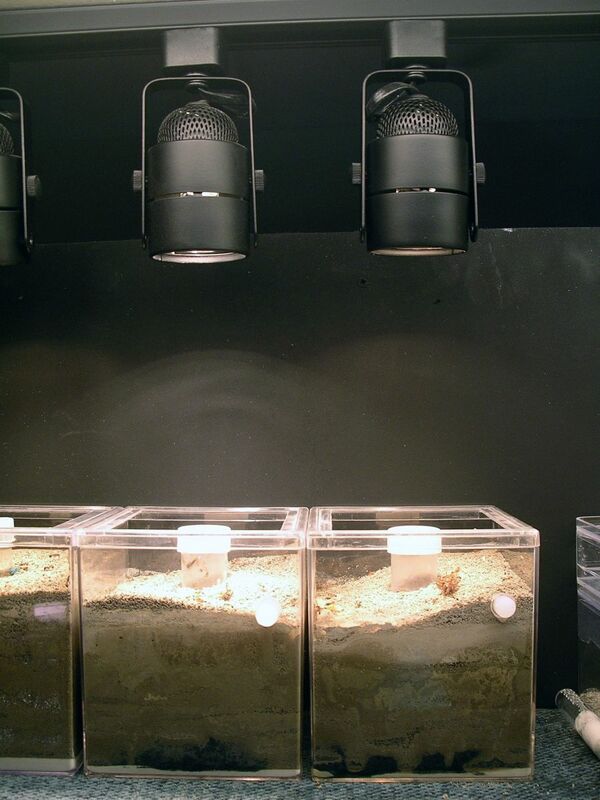 I actually purposely mix sand and clay to make substrate closer to what they nest in, while also something that drys hard. Since Gaige Daughtrey asked, here are step-by-step instructions on how to make these. I use these two containers for this. 1. Pour 1/8" of Hydrostone in the bottom of the larger container. 2. 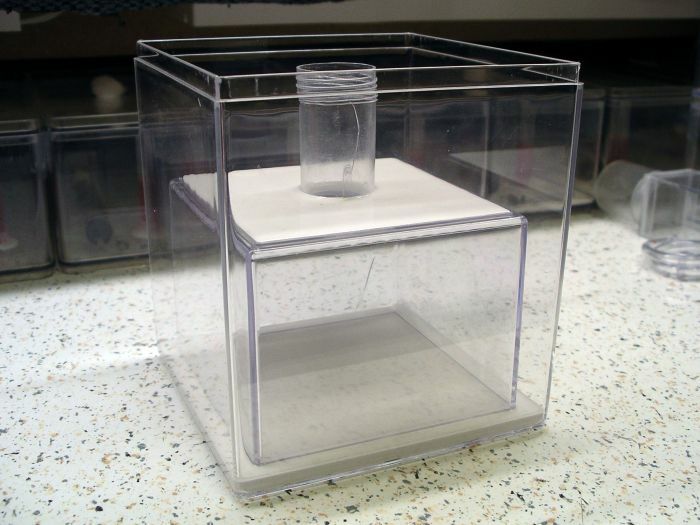 Drill a hole in the top of the smaller container, and attach a tube with a cap (small plastic test tube works great). 3. Cut the bottom off the smaller container. 4. Once the Hydrostone is hardened in the larger container, pour another 1/8" and place the smaller container inside it and let that harden. 5. 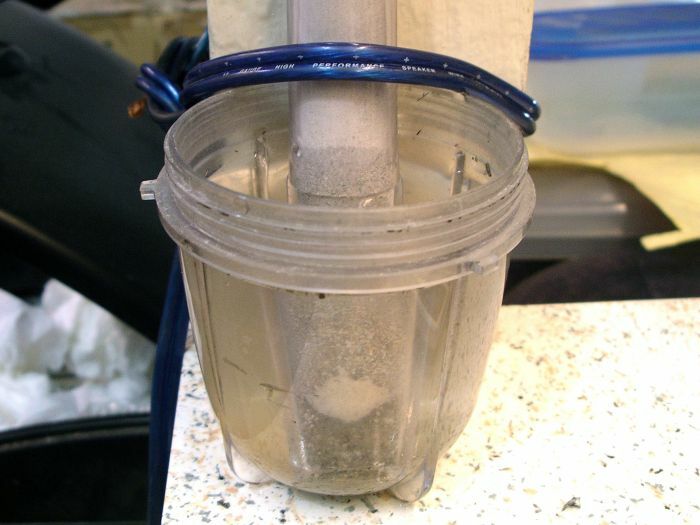 Fill the small container with dirt, leaving the tube empty to act as a reservoir to hold water as you wait for it to soak in. 6. 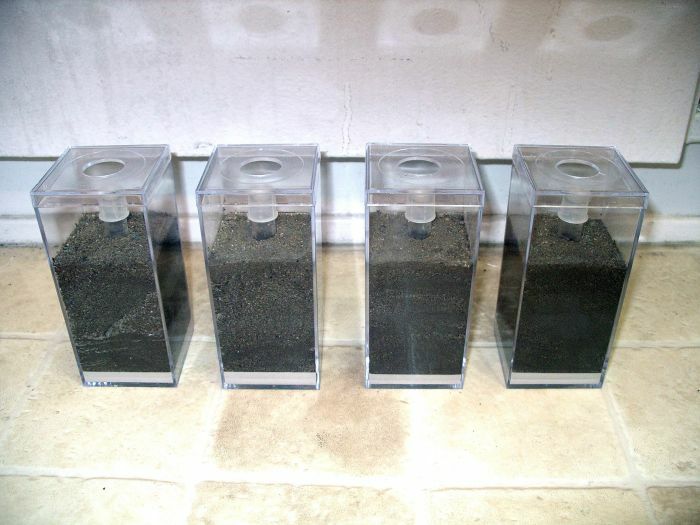 Fill the larger container with dirt until it just covers the smaller container by about 1/8". 7. Drill a hole in the lid and apply Fluon. If only there were such a thing as transparent glass gravel. If ants could build there nest out of this material with some sort of transparent adhesive between the glass gravel, then you wouldn't need two panes of glass to see ants dig in 2 dimensions. Imagine being able to see their nests in their natural 3 dimensions! As for a more eco-friendly look, have you thought about using small cacti or other small plants in your formicariums. There would need to be large rocks of sufficient size and density around the plants to prevent ants from digging around it into the soil where the roots are. 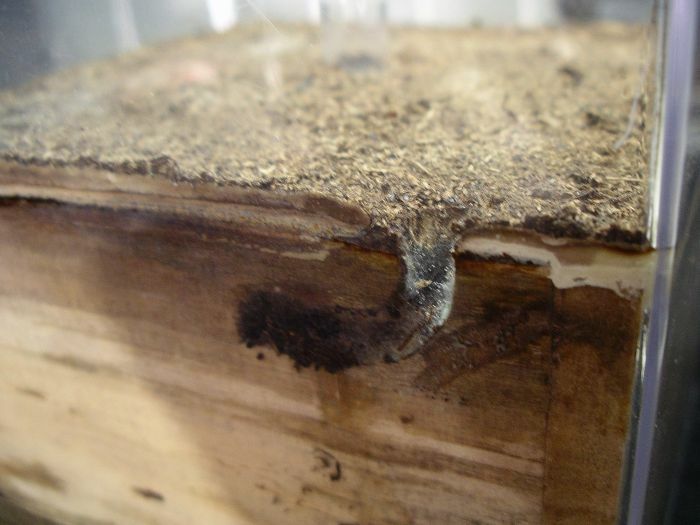 The plants would need a separate container or a porous layer to prevent the roots from growing into where the ants live. Sure I would use plants and things in a big natural exhibit-style formicarium, but that's not what I'm designing at the moment. All the formicariums I'm designing now are for storage. 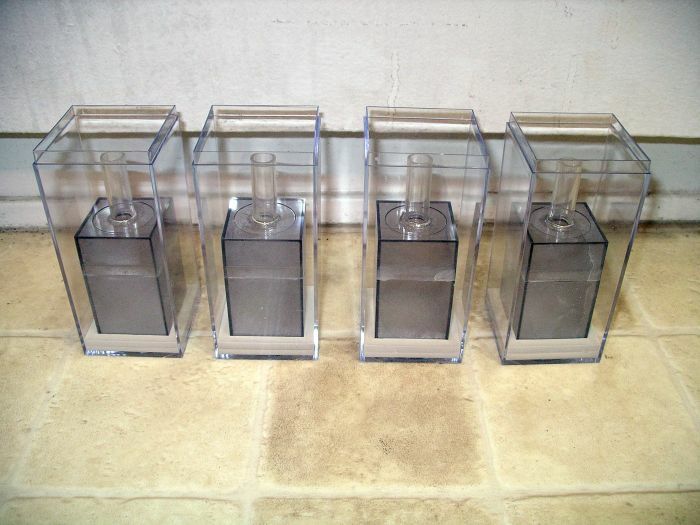 I've been planning to make some of these out of tall cylindrical vases with a sealed pipe in the center for an actual air pressure hydration system as opposite to a simple water reservoir that has to be manually regulated. To figure out the right height, I decided to first find out exactly how high up water will wick up into the clay/sand dirt mixture I use in these. From experience, I'm thinking it is somewhere around 12 to 15 inches, but I have never done an actual experiment to find out for sure. I took my largest vinyl tubing and stretched about 18 inches of it out straight and tied it to a post. i filled that end with the dirt, and set it in a cup of water. After about 10 minutes, you could see the moisture level at about 1/2 inch over the water level in the cup. Obviously the humidity is going to probably make this vary a bit, because the rate of evaporation is going to change. I'll just have to remember that the humidity is probably on the high side because of the length of the tubing. Okay, it's been about six hours now, and the water has soaked up about seven inches from the water level in the cup. It's been at this height for a few hours now, so I don't think it's going to go much further. This means I need to use a container that's tall enough to allow for about 10 inches of substrate at least. This way they will have a perfect moisture gradient. 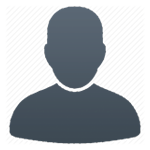 This is your landlord. We saw what you're doing to the place, and we've decided to evict you, effective yesterday. What's great is they're completely rebuilding all the apartments here, so when I leave they're ripping the entire place out. That means it doesn't matter what happens to anything in here; No matter what I get my deposit back. This experiment is still going, and unfortunately the water has soaked up about 16 inches now. This means these things are going to have to be very tall. 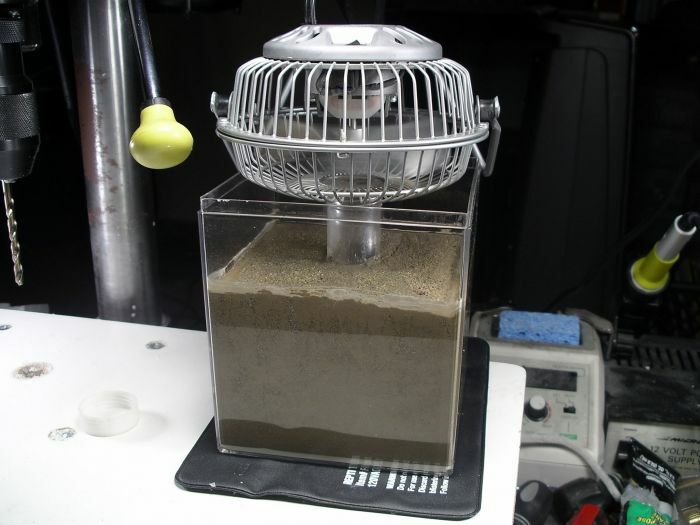 It will definitely be cool to see the ants dig that deep, but this is not going to make them very space-efficient. A question. How will you deal with garbage within the nest? Maybe that doesn't matter in soil nests. Might as well let the insect pieces rot and return to earth. I, too, have been leaning toward a similar setup like this. I'd lose most of visibility though. Or perhaps ... semi-transparent substrate? Edited by dean_k, April 22 2015 - 7:42 PM. Yeah, in a soil nest YOU don't deal with it; the ants and other critters like springtails do. In larger, more mature nests, trash isn't really much of a problem. The colony usually has a dump in the out world where they put all their trash. Every large colony I have always takes their trash out of the nest. BTW, that tube ended up soaking up about 18 inches, so that means the round ones are going to be reallllllly tall. 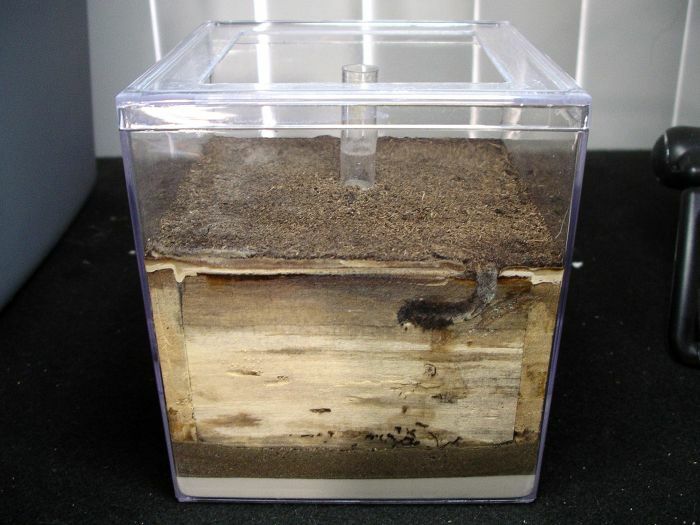 I decided to try making another one of the large square ones for my up-coming Liometopum occidentale colony using rotted wood between the panes of plastic, instead of dirt. Most of this wood I plan on keeping fairly dry, since that seems to be the way these ants' nests are in the wild. I didn't plan this thing out very well, so I made all sorts of mistakes, and it kind of looks like crap. It's okay though, because part of the reason I made this was just to get an idea of what using wood between the panes is like, since I plan on making a really big formicarium like this for Camponotus in the near future. I started a small hole and chamber where they can live initially, and then hopefully continue expanding from there. The wood slabs were VERY soft, so they should have no problem chewing through them. Looking at it now, if I was to plan this out better, I would design it to have a slab of wood covering the top, instead of the layer of Hydrostone and peat moss like i ended up with.